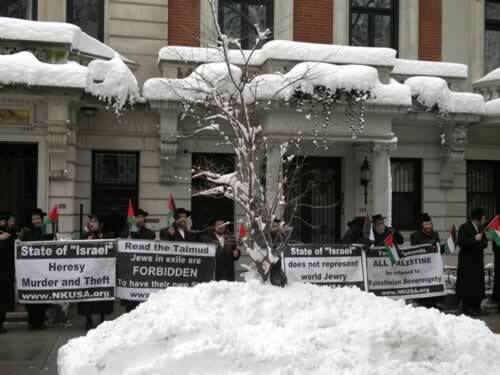 On Thursday, January 27, with the help of the Almighty, Orthodox Rabbis and supporters from the Neturei Karta movement will gather in front of the Palestine Mission to the United Nations at 115 East 65th Street in New York City. At 9:30 AM a delegation of Rabbis will enter the mission to meet with His Excellency Ambassador Riyad Mansour, Permanent Observer of the Palestine Authority to the UN, and present him with a gift: a Palestinian flag to be flown over the mission building. Following the meeting, the delegation will address the gathering of the NK supporters and deliver a message to the press. 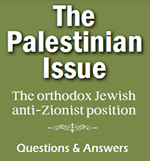 Rabbi Moshe Beck, a former Palestinian resident, Holocaust survivor, and senior Rabbi of the Orthodox anti-Zionist movement, said, "Masses of Orthodox Jews around the world who stand in strongest opposition to Zionism, because founding a Jewish state is against the Jewish belief and the Torah, salute this advancement toward a Palestinian state, and are honored to present a Palestinian flag to be flown high over their mission. We see the proud flying of the Palestinian flag as a step toward the complete peaceful dismantlement of the Zionist state. We are certain, with the help of the Almighty, that a Palestinian government over the entire Holy Land will bring about the harmonious coexistence of Jews and Arabs in Palestine and in the rest of the world, as they coexisted for centuries before the advent of Zionism."